This post is the third post in a series on computing with natural language data sets. For the first two posts, see the relevant section of our main content page. In this post, we focus on the problem of decoding substitution ciphers. First, we’ll describe a few techniques humans use to crack ciphers. We’ll find these unsatisfactory, and move on to a simplistic algorithm which does a local search on the space of all possible decryptions, where we utilize our word segmentation algorithm from last time to determine the likelihood that a decryption is correct. We will continue this series’s trend of working in Python, so that we can reuse our code from previous posts. Finally, we’ll experiment by running the code on actual substitution ciphers used in history. And next time, we’ll work on improving the search algorithm for speed and accuracy. As usual, all of the code used in this blog post is available on this blog’s Github page. Definition: A message which is human readable is called plaintext, and an encrypted message is called ciphertext. Definition: Let be a fixed alphabet. A substitution key is a bijection . A substitution cipher is the induced monoid homomorphism on , the set of all strings of letters in . Then for any plaintext message , the ciphertext is precisely , and for any encrypted message , the corresponding plaintext message is . Note that is uniquely determined by , so that the problem of deciphering a message reduces to determining the correct key. This particular key has a famous name (rot13), because it is simply a rotation of the alphabet by 13 letters. Also, we note that if we call the substitution cipher induced by this key, then we see has the very special property that or equivalently . So applying the encryption method twice actually gives us back the original plaintext message. But of course a rotation cipher is too simplistic; in general a substitution key can match any two letters together to make for a more complex code. Looking at one-letter words, and picking I, A, and occasionally O as the substitution. Looking at short two letter words and three letter words, and trying words like “to,” “an,” and “the” in their place. In other words, partially decipher part of the text, and see if using that partial substitution leads to absurd decryptions of other parts of the message. Find the most common letter, and try substituting that with common letters like e, s, t, r, l, or n.
Unfortunately, most of these rely heavily on a few cop outs. First, the text from this puzzle book included punctuation, word spaces, and other distinguishing features of the English language. In real life, ciphers are usually just one fat block of text, or separated into blocks of a fixed width; when decrypted correctly, a human’s natural ability at word segmentation makes the message obvious. Second, I knew ahead of time that the plaintext message was a famous quote! I had inside knowledge about the content of the message, and so decryption came more easily. Often encoded message are not full sentences, and often the people doing the encrypting will strip out common words, but still maintain the sensibility of the decoded phrase (e.g. “dropoff midnight joeys bar back door”). Furthermore, the text could deliberately have spelling errors and other types of message adulteration to avoid decryption. In other words, the messages in the puzzle book were flawless and designed to be easy to solve. We are more interested in designing a solver which maintains quality in the midst of imperfection and trickery. That being said, the patterns we used as a child give insight into how we might construct an algorithm to decrypt messages. 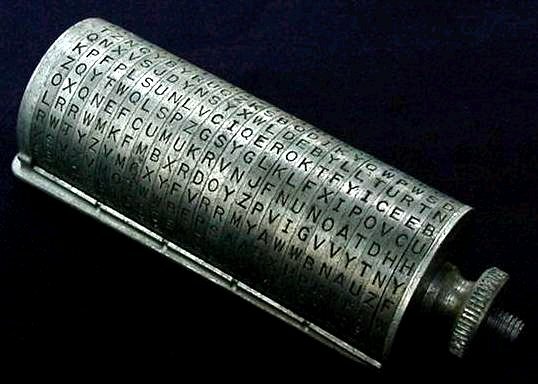 During manual decryption, one would often get very close to the solution and notice that one incorrectly substituted two letters, but that the rest of the message is correct. By twiddling the incorrectly substituted letters, one would arrive at the correct decryption, and pat oneself on the back. This is the key behind the algorithm that follows, in that we will start with a random decryption, and incrementally improve it until we can’t do so any more. But before we get there, we need to figure out how to represent our data appropriately. One easy way to represent a cipher key is much like the example above: simply use a 26-character string of letters like “nopqrstuvwxyzabcdefghijklm” where we assume that the letter ‘a’ maps to the first character of the string, ‘b’ to the second, and so on. This representation will benefit us later when we want to make slight adjustments to a key: we can simply swap any two letters in the list, or do permutations of triples of letters. The translate method of a string is very special: it requires a table of translations from the entire ASCII alphabet of 256 characters to operate. To alleviate the pain of setting this up for relatively simple translations, Python provides us with the “maketrans” function, which when given an input and output alphabet, constructs a translation table in which the i-th character of the first argument is translated to the i-th character of the second argument, and leaves everything else unchanged. Note that here we don’t include capital letters. The interested reader can see the source code for the minor modifications that fix capitalization; it’s not very interesting, so we omit it here. Our general strategy is as follows: start with a random key, and then come up with some sort of way to judge the key based on its decryption. From there, swap pairs of letters in the key to look at keys which are “close by.” If any swap is judged to be better than the current key, use that as the new key, and start the process over again. We stop looking for new keys after a certain number of steps, or we get a decryption with a certain level of accuracy. This algorithm is a common paradigm in optimization. The usual name is “steepest descent” or “steepest ascent,” and the analogy is evident. Suppose we want to get to the top of the highest peak in Tibet. We can start from some random place in Tibet, and look around us. If we are standing next to a place that is higher than we are presently, move to that location and repeat. There are obviously some problems with this algorithm: first, we will always get to some peak, but we may not get to the highest peak. To alleviate this, we can run the algorithm from a large number of random starting locations, and compare all of the peaks we arrive at. Certainly, with enough random starting points, we are very likely to find the highest peak (eventually, we will randomly start on the goal itself, or at least very close to it!). Second, if we were to try this algorithm in Illinois, we might never find any hills at all! This would leave us blindly wandering around some corn field, and is clearly a waste of our time. Before we do any work, we should have a good idea that the space we’re searching through is more like Tibet than Illinois, and preferably we’d only have one major peak. Now, our description of “close by” keys is really that. Recalling our first post in the series on metrics on words, we want to investigate cleverly-chosen keys which are close to the given key with respect to the Levenshtein metric. Using the analogy, we are looking for which directions are higher in 26 dimensions, so we can’t look in all directions for an increase. Instead, we want to know ahead of time which directions are more likely to be higher, and check those directions only. We will see how to do this momentarily. The difficult part, really, is determining the “value” of a given decryption. The underlying problem is one of the main underlying problem in this whole series: how do we tell if a string of characters is sensible language? On one hand, if we know it’s sensible we can segment it. We saw to that last time. But how do we tell if a string of characters is sensible? Of course, it’s well beyond the scope of this post to give an exact answer to that problem, but it turns out that a reasonable approximate answer is within our grasp. As we did in word segmentation by looking at sequences of words, let’s look here at sequences of letters. Definition: A letter n-gram is a sequence of letters, i.e. an element of . Note that even though we aren’t discerning words themselves, a true decryption will definitely contain the common trigrams and bigrams, but if our key is wrong, there are likely (just by randomness) some uncommon trigrams and bigrams in the resulting decryption. Thus, we can take the set of all letter trigrams in a sequence, compute the probability of each trigram occuring at random, and take the product of all of them to get a score for a given decryption. So we need a function which generates neighbors of a given position, and an evaluation function. Before we actually write the real implementation of our steepest ascent algorithm on decryption keys, let’s write the evaluation function, and then the function to generate neighboring keys. Now recall the class we designed in the post on word segmentation that loads the word-count file, and computes probabilities. As it turns out, we can reuse that code to load any file where each line has a word and a count. So with a slight modification and an include, we import the word segmentation algorithm from last time (this is included in our implementation on this blog’s Github page. See the file segment.py for the minor changes). And so we see that for incorrect decryptions, the score is orders of magnitude smaller: they naturally contain many uncommon letter trigrams. To generate neighboring keys, we also use n-grams, but this time we work with bigrams. The idea is this: take the most uncommon bigram found in the attempted decryption of the message, and fix the key by replacing the bigram with a more common bigram. First, we create the bigram letter probability lookup table, as with trigrams. To generate the neighboring keys, first we sort all bigrams in the word so that the least common come first, and then we take the first 30 of them. Then we shuffle the alphabet (so as not to bias the beginning of the alphabet) and look for improvements in the key. Note that this function is an iterator. In other words, it doesn’t “return” a value in the sense that it halts execution. Instead, it “yields” a value until the caller asks for another (with the “next()” function), and then it returns to the computation it was doing until it reaches another yield. This way, we don’t have to generate a huge list of keys ahead of time, and risk the possibility that they are never used. Instead, we cook up new keys on demand, and only compute as many as are needed. Since we will often discover a better key within the first few iterations, this will undoubtedly save us a lot of unnecessary computation. Finally, after exhausting our list of the 30 least common bigrams, we make random swaps, hoping for an improvement. Notice that this function requires both the key and the decrypted message. This alters our steepest ascent algorithm superficially, because the generateNeighbors function requires two arguments. We also changed all of the variable names to be relevant to this problem. We first preprocess the message to ensure everything is lowercase characters (we remove anything else), and then generate a bunch of random starting keys, perform the steepest ascent on those keys, and display the results, along with the most probable, as chosen by word segmentation. Let’s see how it performs in the real world. This is a bit more disheartening because it’s obviously close to correct, but not quite there. A human can quickly fix the errors, switching p with m, and z and k. That being said, perhaps by slightly increasing the number of steps we could find our way to the right decryption. Again, we are close but not quite there. In fact, this time the decryption even fails to segment the last block, even when there are useful pieces inside it. This is a side-effect of our zealous segmentation model that punishes unknown words exponentially in their length. In fact I have yet to see one example of this function returning sensible output for any input. That last one was close, but still rather far off. What’s more, for random small inputs the function seems to generate sensible output! Disregarding the fun we could have decrypting random message, we cry, “What gives? !” It seems that there’s some sort of measure of entropy that comes into play here, and messages with less entropy have a larger number of interpretations. Here entropy could mean the number of letters used in the message, the number of distinct letters used in the message, or some combination of both. The last obvious annoyance is that thee program is really slow. If we watch the intermediate computations, we note that it will sometimes approach the correct solution, and then stray away. And what’s more, the number of steps per run is fixed. Why couldn’t it be based on the amount of progress it has made so far, pushing those close solutions a bit further to the correct key, perhaps by spending more time just on those successful decryptions. Next time, we’ll spend our time trying to improve the steepest ascent algorithm. We’ll try to make it more quickly abandon crappy starting positions, and squeeze the most out of successful runs. We’ll further do some additional processing in our search for neighboring keys, and potentially involve letter 2-, 3-, 4-, and even 5-grams. But all in all, this worked out pretty well. We often emphasize the deficiencies of our algorithms, but here we have surprisingly many benefits. For one, we actually decoded real-life messages! With this program in hand even as few as twenty years ago, we would have had a valuable tool for uncovering nefarious secrets encoded via substitution. Even more, by virtue of our data-driven solution, we inherently bolster our algorithm with additional security. It’s stable, in the sense that minor data corruption (perhaps a typo, or nefarious message obfuscation) is handled well: our segmentation algorithm allows for typos, and a message with one or two typos still had a high letter trigram score in our probabilistic model. Hence we trivially bypass any sort of message obfuscation: if the average human can make sense of the decrypted message, so could our program. And as with word segmentation, it’s extensible: simply by swapping out the data sets and making minor alphabet changes, we can make our program handle encrypted messages in any language. This exponentially increases the usefulness of our approach, because data sets are cheap, while sophisticated algorithms are expensive (at least, good ones can be sophisticated). So look forward to next time when we improve the accuracy and speed of the steepest-ascent algorithm. This entry was posted in Algorithms, Discrete, Optimization, Probability Theory and tagged cryptanalysis, linguistics, mathematics, natural language data, ngrams, programming, python, substitution cipher. Bookmark the permalink.